Was looking up artwork and came upon this. Love love love this story. It's a story of how things flow and come to be. Alexander Melamid, a painter, was looking for a new subject to paint. Naturally he thought of his son who happened to be Dan the Man director of 50 Cent's video at the time. 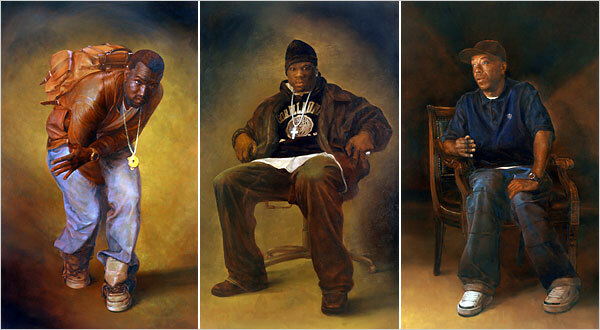 The first painting started out with Dan's business partner DJ Whoo Kid. It turned out so well Dan and DJ Whoo Kid went searching for other subjects for Alexander to paint. That included 50 Cent (who included the work in his "God Gave Me Style" video), Snoop Dogg, Russel Simmons, Marc Ecko, and Kanye West. After "Holy Hip Hop! ", Alexander paints the portraits of contemporary Russian captains of industry next, ha. Gotta love when things come together. have you heard of justin bua? i love his work, it's very urban, but kinda contemporary (?? haha, i'm not art buff!). check him out at justinbua.com. thanks! yup! there's also david garibaldi and ernie barnes too.